Description: Apocalyptic and paradisiac visions of good and evil (where hatred of the Catholic Church and need for it produce two “little sonatas” which express it side-by-side) meet aphoristic miniatures of nine small, mainly malignant insects. Langgaard’s rousing graphic imagery is on full display in this third volume: mysterious forces, poetic gracefulness, obsession and absurd hysteria are all part of Langgaard's both dark and wondrous expression. 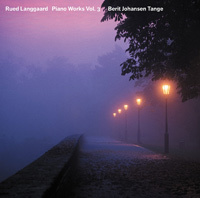 Berit Johansen Tange (piano).